Universal Design, access, interest convergence, neurorhetorics, learning styles, teaching, pedagogy, wiki. Beginning with a series of possible ways to introduce an essay on Universal Design for Learning, this contribution instead resolves to offer a long listing or inventory of different places to start implementing Universal Design in classroom settings. The goal is to reframe Universal Design away from checklists and reductive formulas and towards more critical, problematized and active forms of engagement or "ways to move." The long archive is also offered through a linked Wiki which provides a place to add ideas, respond to those already offered, and suggest ways that access needs might collide. One way to begin this essay would be to argue the why of Universal Design (UD), as I have done elsewhere and as scholars like Aimi Hamraie have done so persuasively in this very venue, DSQ. Certainly, within institutions of higher education, Universal Design offers a much more proactive, useful, and capacious approach to the design of physical/intellectual space than the academic ableism that has structured learning for so long. Universal Design also often usefully syncs with — though it may never fully replace — the model of accommodation that currently retrofits academic practices for disabled students and teachers. At other times UD offers space for critique of this accommodation model. But I have made these arguments already, and I will make them again in the future, and this essay is not the space from which I want to make arguments about why UD is important. I want to assume that DSQ readers, once they are shown, in simple terms, what UD can do in the classroom, will be on board with it as a good idea, as a foundation of disability studies teaching. Another way to start this essay would be to lay out exactly what UD would look like in a classroom: to define it. But this gets tricky as well. Universal Design for Learning (UDL) has been defined as the use of multiple and flexible strategies to address the needs of all students. And, if you can believe it, things get much more vague and in some ways much more simple from here. When colleges and universities present Universal Design on their websites, they sometimes present UD as a checklist. The University of Washington's excellent DO-IT project takes this approach, for instance in this "checklist for designing spaces that are welcoming, accessible, and usable" (n.p.). Many, many other colleges and universities have re-published this checklist, so much so that it has become a canonical "text" in the actual academic "implementation" of UD. But there are some problems with this recycling: how many schools actually use this as a checklist with any teeth, with any consequences? Moreover, turning UD into a checklist defeats so much of the rhetorical purpose of UD, as what I have called a "way to move" (15), or as what Aimi Hamraie has called "a form of activism" (n.p). That is, UD should be registered as action — a patterning of engagement and effort. The push towards 'the Universal' is a push towards seeing space as multiple and in-process. The emphasis on 'design' allows us to recognize that we are all involved in the continued production of space (and that students should be agents in this negotiation). With this said, I am going to very respectfully shy away from listing key features of UD, because I fear that such lists also invite us to believe that Universal Design would stop if the boxes were all checked. I am more interested in places to start thinking, doing, acting, and moving. Multiple means of engagement, to tap into learners' interests, offer appropriate challenges, and increase motivation. And yet when we begin to break these "multiples" down into short lists of strategies, UDL curls up into a ball or folds up into a small package. Of course, the very idea that education is about not just representation, but also expression and engagement is somewhat revolutionary in a world of 500 student classes in which lectures and exams are the norm and a course's content is almost always what a textbook or a professor says, rather than what students think or create. Moreover, "multiple" tells us that there is not just one, nor can there be singular favored ways of representing, expressing, or engaging — and that is an impetus to view students in a radically broader and more empowering way. Yet colleges and universities have begun to define UD by linking it with old discourses of "learning styles" and newer "neurorhetorics." Thus the basic three-part approach, instead of getting opened up onto a broader range of possibilities, gets jammed into much more reifying or rigid paradigms. For instance, the "old" idea of learning styles was first used to cajole teachers to move away from an approach to teaching based around a conceptualization of only one type of learner. Stop believing students all learn one way. Stop thinking they will learn the way you do. This was a good thing, and perhaps still radical. But the consequence has often been a labeling and sorting of students: this one is visual, this one auditory, this one kinesthetic, this one a read/write learner. The discourse also linked learning to an innate and fixed student identity — denying the possibility that learning could be social, a process, and so on. If you Google "universal design" plus "learning style," you'll get all types of charts and images and ideas, and you'll see that advice around UD practices can be pitched to learning style in ways that exclude all mention of disability. Teachers can be asked to deliver materials orally and visually, to accommodate different learning styles, rather than to accommodate disability. To show how this gets mapped onto the three-part UD approach: students are seen as specific types of receivers of representation, or they become specific types of expressers, or they are engagers. But this hollows out the potential for disability as a valued and agentive identity in the classroom: Universal Design becomes a way to erase disability altogether. Several years ago in DSQ, I wrote about this as the danger of interest convergence: "the idea that conditions change for minorities only when the changes can be seen (and promoted) as positive for the majority group as well" (n.p.). This is a true problem for any argument for Universal Design — but here I seek to avoid this convergence by (as you will see) urging you to explicitly link teaching/learning strategies to disability experience. A newer flavor of this interest convergence, and this hollowing-out of the activist potential of UD, also comes in the form of what Jordynn Jack would call "neurorhetorics" (n.p.). In this example, colleges and universities have started to pitch UD as something that reaches all parts of the student brain. That is, the three major "moves" of UD now get located in different parts of the mind. 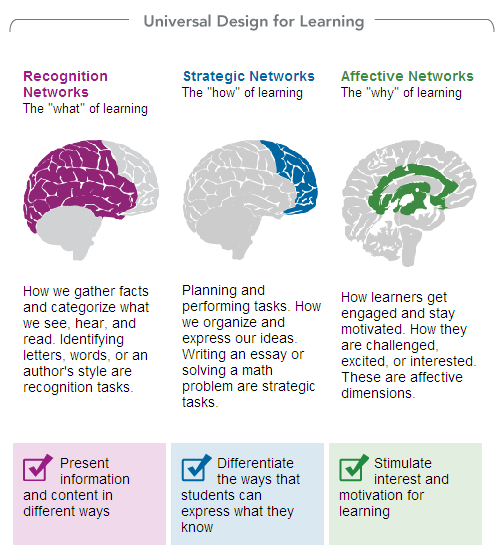 In the following chart, taken from a page on the Canisius College website, but also used by others all over the web, and mainly at educational web addresses, shows how UDL maps across the brain. The top of the chart is labeled Universal Design for Learning, and this forms a sort of umbrella over the rest of the figure. Below this, we view three columns. The left-hand column is titled Recognition Networks, the "what" of learning. We then see a two-dimensional side-view of a brain with a region near the back of the brain shaded purple. Below this we can read: how we gather facts and categorize what we see, hear, and read. Identifying letters, words, or an author's style are recognition tasks. Then we see a shaded box, roughly the same colour of purple as the brain shading above, with a check and the imperative to: present information and content in different ways. The center column is titled Strategic Networks, the "how" of learning. The brain is shown again, this time with a region near the front shaded blue. Below this we read: planning and performing tasks. How we organize and express our ideas. Writing an essay or solving a math problem are strategic tasks. We then see a box shaded blue, and another check, now beside the imperative to: differentiate the ways that students can express what they know. The final column, on the right hand side, is labeled affective networks, the "why" of learning. The brain is now shaded green in a circular pattern near its center. Below we view the explanation: how learners get engaged and stay motivated. How they are challenged, excited or interested. These are affective dimensions. The box is now shaded green, and there is a check, beside which we read the imperative: stimulate interest and motivation for learning. As Jack has shown, these charts make what she calls "neuroclaims" (n.p.). That is, they "reduce complex concepts (often subjectivity or identity) to measurable entities in the brain through reduction" (n.p.). This is dangerous first of all because there is really no scientific basis for such claims — no one has actually studied brain activity during Universally Designed teaching, for instance. But within disability studies, we also know that such claims are most often used to infer deficits (see Yergeau). If we aren't maxing out all the different ways our brains might be engaged, then our brains are somehow deficient. The same things might be true for pedagogy: once we begin to sew types of teaching to parts of the brain, how do we untangle this from the harm of deficit-based thinking? Once we link the "moves" of UD to discrete parts of the brain, how do we see students as more than just different colors of minds? How do we advocate for critical approaches to teaching beyond the idea of maxing out all modes of teaching, all of the time? What I would much rather do in this essay would be to give teachers like you and I some places to actually begin changing the classroom and the syllabus, without delimiting Universal Design or using it to demand a maxing out of modes, without packaging it as a neurorhetoric or mapping it across the brain. What I want to do is to present UD not as a grand solution that can be neatly packaged, but in fact as a variety of teaching strategies, each of which might be a good solution in the classroom but might just as well create what Margaret Price calls "conflicts of access" (n.p.). That is, the strategy we use to make engagement more accessible for one student could be experienced as profoundly limiting for another. Moreover, often the demand to make a class accessible can be experienced as conflicting with a teacher's access needs. Each of these conflicts should also be seen as a space in which "accesses engage" with one another rather than just colliding, as Dale Katherine Ireland reminds us, and an opportunity to rethink the space, time, and infrastructure in which these conflicts arise (n.p.). The final way to start this essay, then, would be to suggest that you not read it as an essay at all. Because, in fact, this piece is missing many of the hallmarks of traditional academic research. First, although the essay has my name attached to it, the key materials presented here have been collaboratively created over many years, in concert with colleagues. Here is an inventory of co-authors, much too long to fit on a properly formatted citation: Cindy Lewiecki-Wilson, Amy Vidali, Stephanie Kerschbaum, Margaret Price, Allison Hitt, Melanie Yeargeau, Shannon Dea, Rose Padacz, Craig Meyer, Joshua St. Pierre, Elizabeth Brewer, Sushil Oswal, Melissa Helquist, Brenda Brueggeman, Sarah Gibbons, Bernice Olivas, Nicole Green, Dev Bose, Zosha Stuckey, Shannon Walters, Nicole Quackenbush, Hilary Selznick, and many others. Further, this essay has no real thesis, and it offers no real solutions to the reader. But I believe that part of the ongoing problem with UD is that it is being checklist-ified, over-simplified, hollowed out, and torn apart from the actual, tricky, ongoing negotiations of classroom practice. So instead I offer an exhaustive inventory of Universal Design "places to start." The idea is to try any of these suggestions out in your own classroom, and see where they go. Yes, this is also a list, but I hope you will approach it as a list of places to start and as an invitation to join a process, rather than seeing these as objectives to be checked off. Finally, because these suggestions also live on a Wiki, this isn't just an essay at all — it is a text you are invited to rewrite. A Wiki allows you to go in and edit the suggestions, talking back to them about their effectiveness, ineffectiveness, the access clashes and conflicts they might invoke, and how they could be revised. You are also invited to add your own "places to start" to make this list grow. Some of the more straightforward of these suggestions are adopted from the Council of Ontario Universities' "Accessible Campus" project – their guidelines are meant to be circulated and used by all educators. Appended to this article, then, is a long list of UD suggestions, organized according to some of the different modes of "delivery" or styles of teaching in higher education. You aren’t expected to read this entire list, really – you can jump in anywhere. Please also visit the Wiki at www.UniversalDesignIdeas.pbworks.com to become a co-author of future problems and possibilities. I have concerns about the accessibility of the Wiki platform (see Taras et. al.). Thus, the entire list will be produced as an appendix to this article in a screen-readable format, of course – so that if the Wiki is not fully accessible to you, you can still access the list and email your comments, suggestions, and ideas to Dolmage@uwaterloo.ca. Dolmage, Jay. "Mapping Composition." Disability and the Teaching of Writing: A Critical Sourcebook. Brueggeman, Brenda and Cindy Lewiecki-Wilson, Eds. With Jay Dolmage. Boston: Bedford St. Martin's, 2006. 14-27. —-. "Disability Studies Pedagogy, Usability, and Universal Design." DSQ 25.4 (2005). Hamraie, Aimi. "Designing Collective Access." DSQ 33.4 (2013). Ireland, Dale Katherine. "Spacetime Remix: When Accesses Engage." Conference on College Composition and Communication. Indianapolis, IN. March 20, 2014. Price, Margaret. "Access: A Happening." Featured session, in collaboration with Jay Dolmage, Qwo-Li Driskill, Cynthia Selfe, et al. Conference on College Composition and Communication. St. Louis, MO. March 23, 2012. Taras, C., O. Siemoneit, N. Weiber, M. Rotard and T. Ertl. "Improving the Accessibility of Wikis: A Basic Analytical Framework." Computers Helping People with Special Needs: Lecture Notes in Computer Science 5105 (2008): 430-437. Yergeau, Melanie. "Clinically Significant Disturbance." DSQ 33.4 (2013). Click to view the list of Universal Design ideas (PDF).